To log into Brightpearl visit the www.brightpearl.com website and click on Login in the top right of any web page. Enter your account ID and click Sign me in! You’ll be taken straight to your log in screen. Your account ID is assigned when you first sign up with Brightpearl. By default it will be the same as the company name you signed up with (with no spaces), unless you edited it during the sign up process. If you cannot remember your account ID please contact our Support team support@brightpearl.com. No, it is not possible to change your account ID. But this ID is used only for getting to your log in screen and for identifying your account to us at Brightpearl – when you raise a ticket with or telephone Support for example. We recommend you bookmark this page on your browser. To log in you'll need your email address and password. This is the email and password used when you signed up or if you have been added as a new staff member the password will be emailed to you. Passwords are automatically generated for new staff members and emailed to them. They will be asked to choose a new password when they log in. If you have forgotten your password, click the Forgotten your password? link to request a reset; this will be emailed to you. You can set passwords to be more secure and expire at regular intervals at Settings > Other > Security. To log out click on your username at the top of the application and click Log Out..
You will also be automatically logged out after 30 minutes of inactivity. The menu bar is where you can access each different module that makes up Brightpearl. Click on any item to display the menu. Each time you log into Brightpearl you will be taken to your homepage. In a demo account you will see useful contact information to get in touch with us. Once you have signed up you'll see the Home Dashboard which provides an overview of your company activity across sales, accounts, helpdesk and products, all in one place. But you can set your homepage to be any other screen in Brightpearl, this can be useful if you always navigate to a particular area or perform the same process on logging in. To set any screen as your homepage first navigate to that screen. Once the screen you want is displayed, scroll right to the bottom and click the Set as home page link. A green message box will be displayed to confirm it has been updated. The next time you log in you will be taken directly to that screen. You can return to the Home Dashboard at any time by clicking on the Home icon on the far left of the menu bar. If you've changed your Homepage but want to revert it back to the Homepage Dashboard, paste this link into the URL after '.com': /dash2.php?dash_id=dash_home. You'll be taken to the original Dashboard - now set this as your Homepage. The setup area is where you can control and create all the details you need in order to fit Brightpearl to your processes. To navigate to the setup area click on the Settings link at the very top of the screen. The settings screens are organized into sections, click on the headings on the left-hand side to expand the menu and then make your selection. Make sure you click the Save changes button before leaving a screen. You can easily search for records within different areas of Brightpearl by using the Quick Search. Find the Quick Search box in the top right-hand corner. First select the area of Brightpearl you want to search, enter your search term then hit enter or click Go. Hint! Leave the search box empty and click Go to search for all records. You can find help on-screen within Brightpearl with the getting started guides, on our website in the support area and on our YouTube channel. Keep up to speed on Brightpearl as a company by following us on Twitter, Facebook, LinkedIn and subscribe to our blog RSS feeds. Make sure to read our release notes so that you know what's new in every upgrade. Most screens in Brightpearl have a getting started guide displayed at the top of the screen. These guides give you a quick overview of the screen you are in with links to external documentation and videos. Once you've read the help you can hide it by clicking the Hide help link. And if you want to have a quick read at any point in the future, you can display it again by going to Help > About this screen at the top of the screen. You can find out a lot about using and setting up Brightpearl with our online documentation. It's all free and accessible any time you need it. Use the Support link at the bottom of every Brightpearl screen to open the search page in your browser. We've got a selection of videos to help you learn how to use Brightpearl. You'll often find these within the relevant help guide on our website, but you can browse and search all our videos on our YouTube channel. Use the icon at the bottom of any Brightpearl page to navigate directly our channel on YouTube. Use the icons at the bottom of any Brightpearl screen to navigate directly to our pages on Twitter, Facebook or LinkedIn. Use RSS feed to subscribe to our blog. If you need more help you can raise a ticket with the Brightpearl Support team and someone will give a personal response. If you are having problems on a specific screen they may ask you for the RUID code which helps us trace any problems better. You can find this code by clicking on the question mark in the bottom right of the screen. Need more help? Why not subscribe to one of our pricing plans, which include telephone assistance as well as other benefits. Or how about some training? Please raise a support ticket to enquire. The Quick Add button is available on screen where ever you are in Brightpearl, helping you to work faster. Favorites allow you to save quick links to anywhere in Brightpearl and save reports with search criteria so you don't have to enter your filters every time. To create a new favorite link navigate to the screen (and apply any filters if relevant) then click on the Add to favorites link at the bottom of the Brightpearl page to save the filters for next time. You can do this throughout Brightpearl! Enter a name for your search and specify whether you want to make this favorite available to all users or if it's just for you. To access your favorites click the Star icon on the left-hand side, just above the notification area. Notifications are displayed on the notification bar on the left-hand side of the screen. These notifications refresh every 5 minutes. Notifications are dependent upon the reminder days set on contact statuses. A contact on a status with reminder days will pop-up as a notification when the contact remains "untouched", that is to say that no communication has been recorded on the contact (emails or notes added with a type of incoming or out-going call). Sales (quotes, orders, invoices) will show as a notification when they have been "untouched" for the number of reminder days set against the sales status. Purchases (quotes, orders, invoices) will show as a notification when they have been "untouched" for the number of reminder days set against the purchase status. You will be notified of both sales and purchase invoices as soon as they are overdue; based on the invoice payment due date. You will be notified of tasks as soon as they have gone over their due date. Notifications display immediately for any helpdesk tickets that remain unclaimed by a staff member. You'll see checkboxes used on lists throughout Brightpearl. 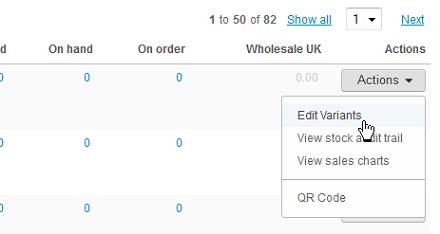 You can click these boxes to process items in batches, you'll find various options available at the top of the list. It displayed what we call the Mini Tabs and these represent some of the information sections available within a customer or supplier record. These tabs are displayed all throughout Brightpearl to provide quick access to contact information, for example, when creating orders or invoices. It’s possible to simply click on an email address and begin writing an email to someone. When it is sent it will be recorded against the contact timeline. If you wish to send text messages from within Brightpearl you can integrate Clickatell. This will then allow you to click on mobile telephone numbers and send a text message. Once sent the message will be recorded on the contact timeline. Use filters to narrow the results in your report then sort the results as desired. Each report provides the filters section to allow you to narrow down your results or perform an advanced search. From your report click the Show filters button. Make your selections and click the Filter report button to apply them and see the results. You can even search by your custom fields, click the Add filter link and select which of your custom fields and what entry it should have. Filters can also be applied by clicking on details directly within the listed results. For example, if you have a list of purchases and would like to see only those to a particular supplier all you need to do is click on their name in the list. Sort your results by clicking on any heading that displays two arrows. Click once to sort in ascending order, click again to sort in descending order. When a list is sorted by a column you will see the heading highlighted. Preset views are used to save personalized screen views. A preset view will save the filters and columns so that you can easily begin to a workflow or export data time and time again. To save a new preset, apply the screen filters, columns and sorting, then choose "Save as a new preset" within the filters section. The export button is available on all Brightpearl reports and data lists. This allows data to be pulled into spreadsheets for analysis or for manually transferring data to another system. When exporting there is no need to filter first and view the results, simply select the filters and click Export to send the results straight to a file. 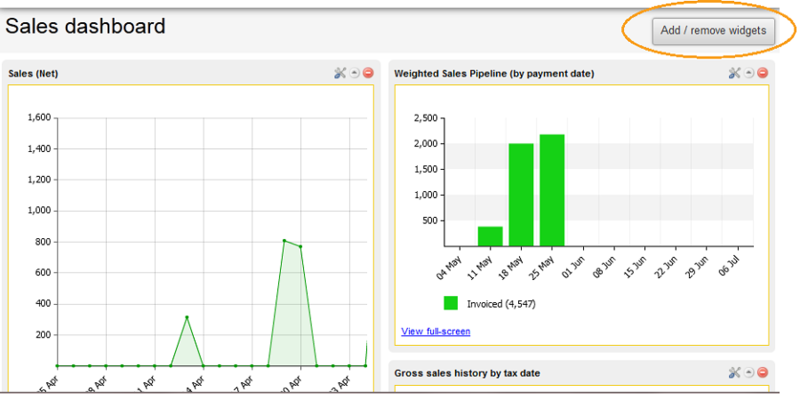 Dashboards allow you to get an overview of data and activity in a particular area of the business, such as sales or accounting. You can customize your dashboards by adding widgets and adjusting their individual settings. You'll often find handy short-cuts in Brightpearl! Hover over icons to find out what they are. Action buttons display more options. Look out for extra actions by clicking on the drop-down arrow on save buttons.